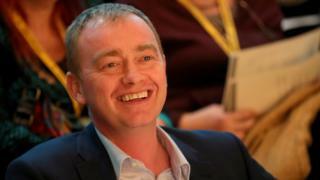 Lib Dem leader Tim Farron has said he does not believe being gay is a sin, having earlier been criticised for not clarifying his views on the issue. When asked about his Christian beliefs on Channel 4 News after the election was announced, he would not say if he thought homosexuality was a sin. And when Conservative MP Nigel Evans asked him about the matter, Mr Farron clarified his stance. Mr Farron has stressed that he supports equal marriage and LGBT rights. In the House of Commons, he was asked by Mr Evans: "A lot of his views will be asked about over the next seven weeks, and he was asked one question which he refused to give an answer to, and I'd be interested if he could today. "Does he think that being gay is a sin?" Mr Farron replied: "I do not. And I tell you what, I am very proud to have gone through the lobby behind him in the coalition government where the Liberal Democrats introduced gay marriage, equal marriage, and indeed did not go as far as it should have done in terms of recognising transgender rights. "However, there is much more to be done, and if we campaign in this election, as we will, for an open, tolerant, united society, then we need to make sure that we do not in any way be complacent about LGBT rights, not just here, but in other parts of the world." During the debate on holding an early general election, Mr Farron also said the Conservatives would be "taking candy from a baby" when it came to claiming seats from Labour - and repeatedly failed to rule out another Tory coalition. Mr Farron had been asked about his religious beliefs three times on Channel 4 News, each time refusing to say if he agreed with the biblical view that homosexuality was a sin. Instead, he said he was "passionate about equality, about equal marriage and about equal rights for LGBT people" and that he did not want to "make theological announcements". His comments on the Tuesday evening show were criticised on Twitter however, with comedian David Walliams writing: "Mr @timfarron you are definitely a sinner for your continued intolerance & prejudice. Please try and join the rest of us in the year 2017." Presenter Sue Perkins also said she thought his views were out of step with the modern world, and former Coronation Street star Charlie Condou said on Good Morning Britain: "I think he should absolutely say what he means. His voting record is very strong on LGBT rights, certainly stronger than Theresa May's, so his actions perhaps speak louder, but I think he should perhaps stop sitting on the fence." Mr Farron, speaking in Richmond as he launched the Liberal Democrat election campaign, told the Press Association: "I have never judged anybody. I am massively in favour of people being absolutely free to have the right to love who they love, be who they are, marry who they marry. "As a liberal I believe in human rights, in equality for every single person ... and LGBT rights are absolutely central to those human rights I am massively passionate about." He said the electorate should judge him by his voting record, adding: "My belief for equality runs through me like a stick of rock and likewise through our party as well. "I am a liberal to my fingertips and that especially applies to LGBT rights." Mr Farron's party said more than 5,000 people joined them in the hours after Prime Minister Theresa May revealed she was seeking an 8 June election.